The Facebook page for NYUSecrets. 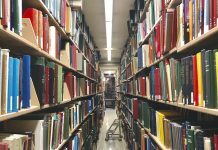 The page moderator recently posted a link to a survey to give feedback on NYU Wellness and Counseling due to the high number of Secrets posts critiquing these services. Classes, internships, social activities — the administrator of the popular Facebook page NYU Secrets has a life like most other students. That is, aside from covertly running a site for 40,000 people, reading through dozens of anonymous and often jarring anecdotes a week and working directly with NYU’s Student Health Center to leverage her admin position as a tool for good in the NYU community. The page’s admin, a Gallatin senior, chooses to conceal her identity from the public, going by the moniker “admin” like her predecessor. She said the dozens of stories submitted to the page anonymously each week range from comedic to concerning. However, two or three of every 100 secrets stop her in her tracks. 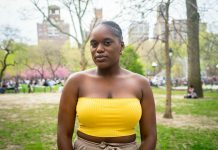 These secrets often pertain to mental health issues and instances of sexual assault at the university, or alleged shortcomings in NYU’s services for students coming forward with these experiences. Stories like these have fueled her recent push to use the platform as a way to hold NYU accountable. One submission in particular, published on Aug. 8 of last year, detailed a student’s attempt to get help from the Wellness Exchange after they were raped, only to be told not to drink too much next time. Having experienced sexual assault in her own life a month beforehand, the admin said reading the student’s account of the Wellness Exchange’s poor response outraged her. She posted the secret and tagged NYU in the comments on Facebook, hoping for a response. Toward the end of that month, the admin received an email from Wellness asking her to post a statement. She agreed under the condition that she could meet with university administrators. Since then, she has been active in orchestrating change — working with the SHC to create a forum, which made its debut in August of last year, where students can come to the admin with negative or positive experiences about the Wellness services. Students can choose to what extent of information they can provide. The admin emphasized that she prioritizes the privacy of her users, and this partnership will not impact the function of the page. Legal boundaries on health-related information and limited information have restrained the success of this program and caused frustration — a roadblock that the NYU Secrets admin hoped to overcome in a meeting on March 28 with Director of Counseling and Wellness Zoe Ragouzeos; Assistant Director of Counseling, Wellness and Sexual Assault Rebecca Whiting; and Executive Director of the Office of Equal Opportunity and Title IX Coordinator Mary Signor. The admin said that they are still in the early stages of improving the program, but she has hopes to work with multiple departments at NYU. Ragouzeos reiterated the difficulties of this partnership — especially the challenge of investigating feedback passed on by the NYU Secrets admin which usually doesn’t include many details and the fact that it’s illegal for the SHC to provide people with information on another student’s health without their explicit permission. 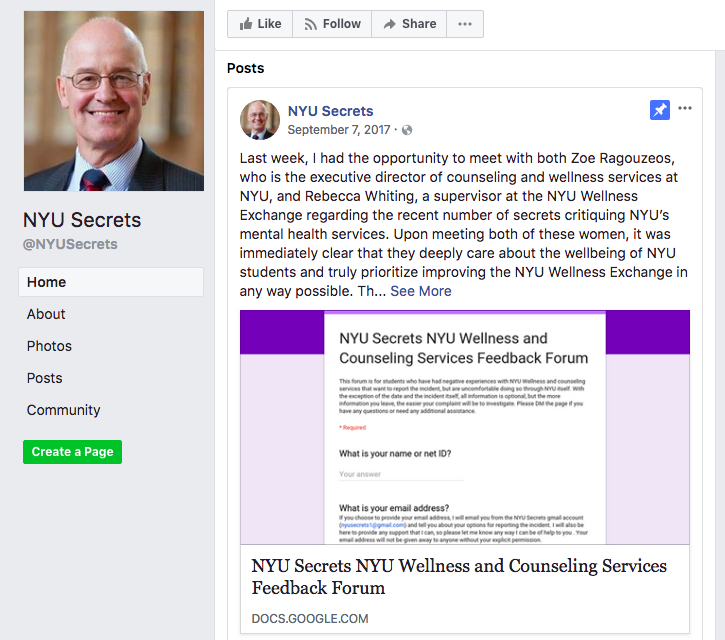 Both Ragouzeos and the page’s admin pointed out that students may feel more comfortable coming forward to NYU Secrets than using the various channels offered by the SHC, which Ragouzeos considers to be a great benefit of the partnership. 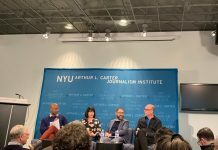 “It’s hard to come forward about things, especially when you’ve been wronged by an institution it can feel weird to go to that institution to report something that happened,” the NYU Secrets admin said. In addition to the 20 cases she is working on currently, the admin said she plans to start a foundation for NYU Secrets with former admin — site founder and 2015 graduate Aristotelis “Aristo” Orginos — who was outed by NYU Local in August 2014. Controversy surrounded the page after it was reported that Orginos participated in the Men’s Rights Movement. NYU Local also reported that he used Reddit to lash out against the page’s users, particularly women. Despite this, many commenters on the page have called for a return to Originos’ era of management — criticizing the current admin for inserting too much of her own voice into the conversation and focusing on social change. 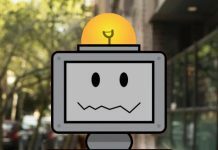 Someone even created a Facebook page, NYU Secrets 2.0, dedicated to carrying on the community of the Originos-run NYU Secrets. As the current admin finishes up her last semester and plans to hand off the page soon, she is seeking a replacement that prioritizes the same wellness efforts and hopes NYU Secrets will continue to positively influence the community. She thinks NYU’s Wellness Center does good work, but there are inconsistencies. 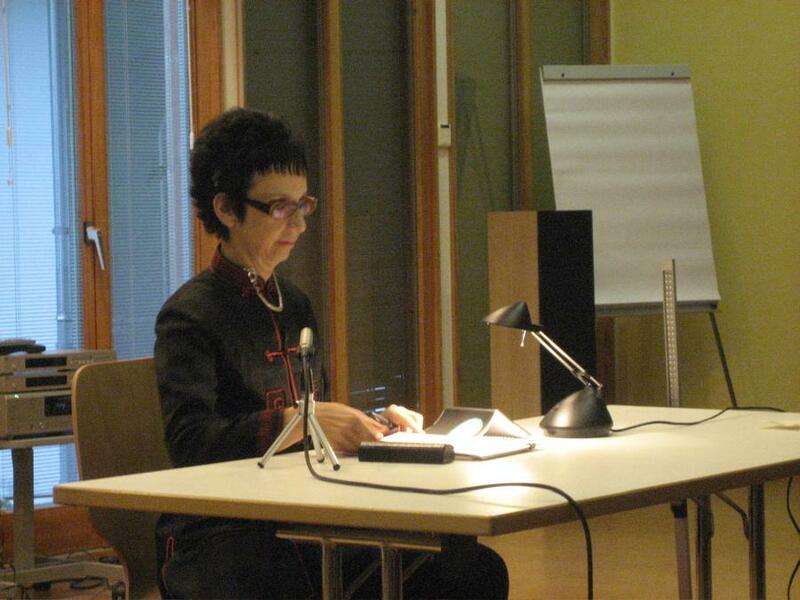 She has read submissions from people who had extremely positive experiences and others who had the opposite. 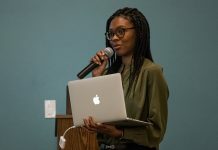 Overall, she seeks to encourage higher standards for NYU’s Student Health Center services but appreciates how representatives from the departments she is working with have supported her thus far.